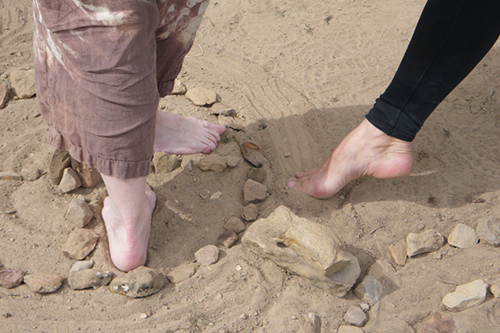 Julie Leir-VanSickle and Bridget Close blessing an altar built outside a coal mine in Sego with an improvised dance. - Cisco, Miners Basin, and Sego. 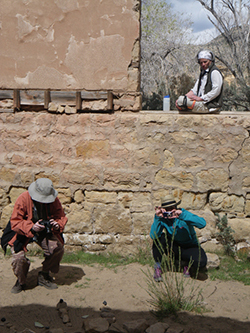 Ghost Town prompted a week of primitive camping by four members of Callous Physical Theatre. Directed by husband and wife team Paul Zmolek and Joséphine A. Garibaldi, long-time collaborating members Julie Leir-VanSickle, Bridget Close, Garibaldi and Zmolek spent the week exploring and experiencing the living artifacts of three Utah ghost towns, Cisco, Miners Basin, and Sego. Paul using chance operations to develop prompts for "dialogic devising" while Joséphine documents. "Our work is based in dialogic devising, a collaborative methodology for creating original performance installations. Julie and Bridget have worked with us for seven years and they each direct – Julie with her Creative Moves company and Bridget with Old Town Actors Theatre – so it is such a pleasure to create with them," reflects Zmolek. "When we got to each of the sites we didn’t say anything." Garibaldi adds, "We intuitively dispersed, each of us exploring whatever attracted us." Armed with still and video cameras, audio recorders; pens, pencils, crayons, journals, and pads; sunscreen and a Ouija board, Bridget built altars out of found materials; Julie took rubbings of surfaces of all sites and journaled her impressions; Paul recorded audio; and Jo shot the scenes. Joséphine documenting Julie’s dialogically devised dance in Sego installation created by Callous Physical Theatre. 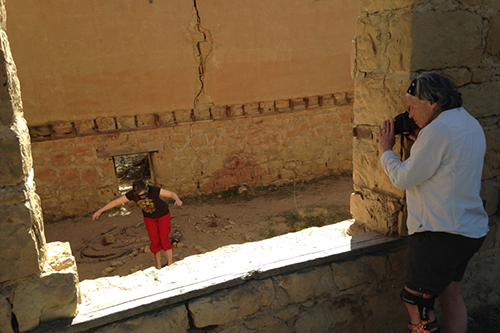 Movement was created in response to text prompts generated while taking a hike in Sego canyon. From this, phrases developed and were structured into choreography, which was performed for video within an installation created by the company members at the Sego site. "This project was extremely important for Paul and I. We love the desert and Utah deserts offer an especial diversity. Weeks prior to our trip, we spent a lot of time discussing the topic, the concept of Ghost Town. Our operating subtitle was Pareidolia, that is, according to Wikipedia, 'a psychological phenomenon involving a stimulus (an image or a sound) which is perceived as significant'," Jo recalls. "Somehow the idea of imposing a Ouija board at each of the sites became a starting point with which to make work. Once at the sites, however, the idea of the Ouija board was ditched. Clearly it was contrived, nearing pastiche." Bridget and Julie are very, very dear to us. To be able to share this experience with these two remarkable women impressed upon us a deep, lasting, and intimate relationship that is difficult to mark in words. Each of us are devoted to process, the space that allows for a revealing, an unfolding of that which is yet to be discovered. Each of us revels in discovery because each of us is a life-long learner: we are open to accepting that our work takes us where we need to go and accept that knowledge offers itself in many unexpected manifestations. Sharing this together, while individually and privately, was really powerful.